The Seychelles Tourism Board (STB) took part in the 21st East Mediterranean International Tourism and Travel Exhibition (EMITT), which was held from January 26-29. This was a step forward in the strategic approach to strengthen Seychelles’ position on the market where there is potential for future growth. 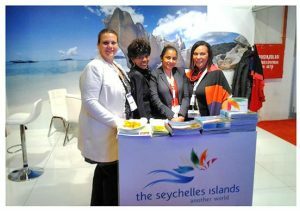 Seychelles was being represented by STB’s Regional Manager for Italy, Turkey, Israel, Greece , Malta&Cyprus, Monette Rose, and senior executive Amia Jovanovic-Desir, Director of Sales and Marketing of The H Resort Isabelle Le Strat, and the Sales and Marketing Manager of Avani Seychelles Barbarons Resort&Spa, Crystal Abrams. The two representatives of the tourism trade left Istanbul full of requests and very satisfied with the huge level of business, which surpassed all expectations. Miss Rose and the rest of the delegation were very satisfied with the outcome and the level of business conducted throughout the fair. “I am extremely happy I attended EMITT; my presence there has helped us to understand the demand of the market. What we need to do now is to continue intensifying our presence through various activities hence ensuring that we keep the destination top in the minds of both the trade and the consumers. We need to follow up with a workshop to keep the market afloat,” said Miss Le Strat. “Our presence on the market is to create awareness and inform people that we exist,” said Miss Abrams. The fact that Turkish Airlines has started operations to the Seychelles with three weekly flights since October 2016 was a fabulous piece of news for the Turkish trade and media, as well as for directing visitors to the Seychelles’ stand. Interestingly, those who have already been to Seychelles also paid a visit, and they shared their experience to those who are in the process of planning a visit to the islands. Amazingly, a strong pool of agents visited the fair to target high-end products. Nevertheless, there is also demand for smaller establishments too. The concept of Seychelles Secrets accommodation was also well presented. Interest from trade and visitors ranged from Iran, Iraq, and Azerbaijan to Belarus and Bulgaria, just to mention a few, and now with the direct flight, the number of visitors from this region is expected to increase. “The core work has now been done with the seeds sown. We need to continue to water them so that they can produce successful results,” said Ms. Jovanovic-Desir. “We were impressed to see large numbers of visitors who were collecting the last bits of information available and we all left Istanbul immensely satisfied,” commented Miss Rose.